I guess I will start this with a where have I been part 3 (or 4 this year it's getting hard to keep track of anymore). Last Tuesday someone came and ripped up the carpeting in my son's room (the area that got pretty much 90% of the water from the pipe that exploded) and I was told the next day someone would come to replace it all. I thought all was well and we would be piling all the son's toys back into his room and out of my nail room that night. Wrong. For the rest of the week I got to play phone tag with said carpet person. First it was he would be there on Wednesday at a certain time and that time rolled around and I waited and waited and waited. I didn't want to start swatching and be interrupted, so I thought to just not swatch at all that day. Well then Wednesday became Thursday and Thursday became Friday. They did finally show up Friday to install the carpet...mid me doing outside projects. We moved in where we are in October, so not really the best time to start cleaning up the outside and I have been itching to make it look all nice and pretty outside. I got ahead of myself trying to do everything at once outside (we still have some to do because the house with 0 trees in their yard end up with all the leaves from the neighborhood) and by the time I was done, so was the weekend. >_< Yesterday I finished getting my nail room back in order and donating a nice chunk of toys from the little one's room, so here I am trying to get back in the groove of things! Belle of the Mall has a coral jelly base with holographic silver hex glitter in various sizes. All nails are 3 coats with top coat. Daisy About You is a pale green crelly with neon green, lavender and white glitters including lavender flower glitter. Shown is 3 coats with top coat. Full Bloom Ahead is described as a white based polish loaded with small, medium and large hex glitters in fuchsia, navy, teal, gold and orange; colors reminiscent of those floral tones that signal spring is near. These photos are 3 coats with top coat. Full Bloom Ahead just screams spring! I know a few of you are dealing with more snow right now (I won't lie, I am taking pleasure in having a nice sunny day :X), so it's a little like the spring for those in the Eastern US with having flowers through the snow. ;) Or at least it supposedly being spring, even though it feels more like winter outside. Laugh Myself Lily is a jade crelly polish with holographic hexes in gold, pink, sliver, lavender and blue along with pink and light aqua dots. All nails are 3 coats with top coat. Make My Gray has a light gray crelly base with turquoise, gunmetal, pale aqua and coral glitters. Shown is 3 coats with top coat. 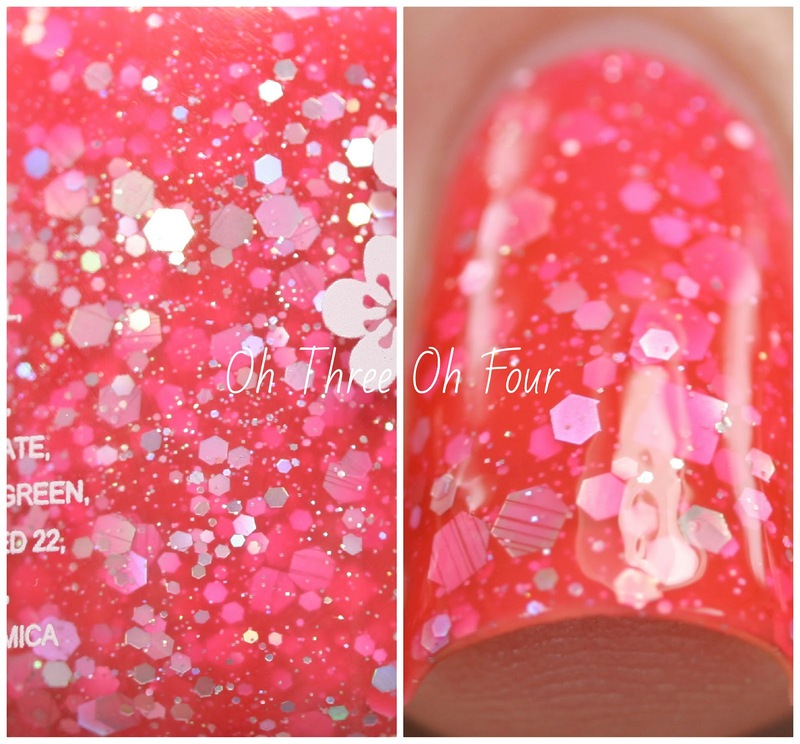 Rush Flower Traffic contains fuchsia, gold, green, sapphire, and aqua hex and dot glitters in a clear base. All nails are 1 coat dabbed over 3 coats of My Life's Porpoise. Of course I could have used this polish over any of the KBShimmer cremes, but I thought it really popped over My Life's Porpoise. It reminded me the pretty flowers that come out after all the spring rain. 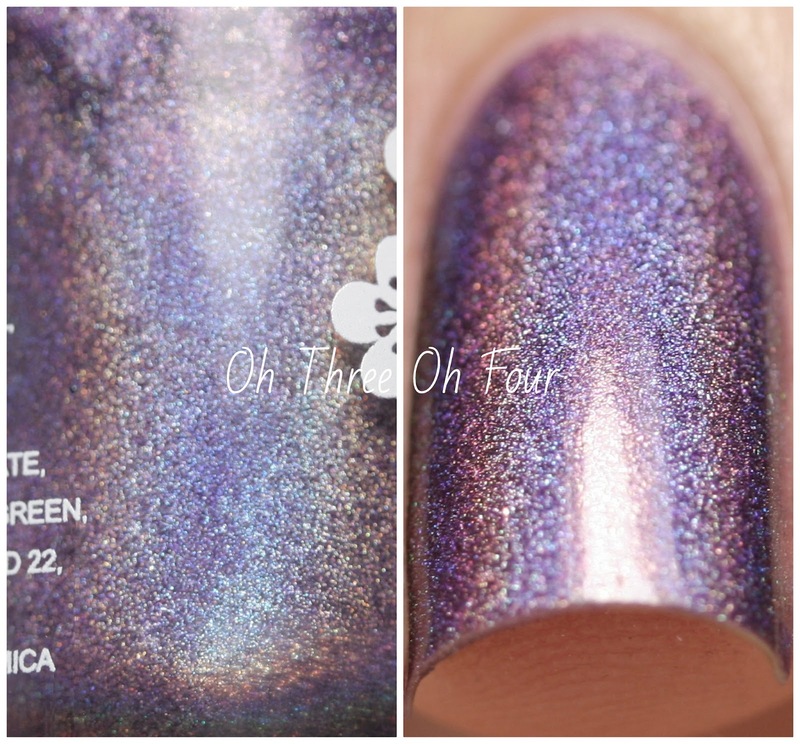 :) Quick and Flirty is a deep violet linear holographic polish. These photos are 3 coats with top coat. 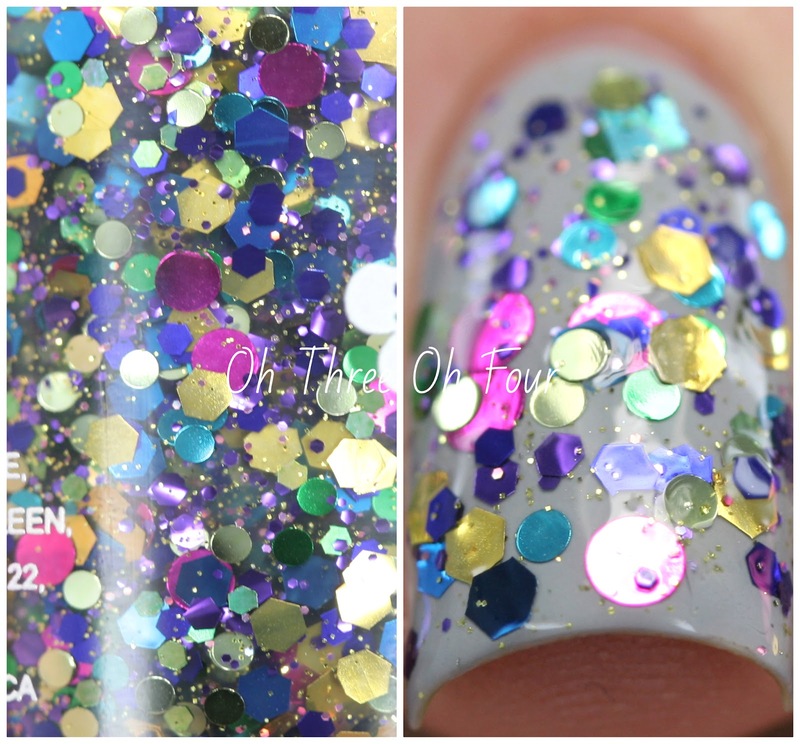 Prism Break is a linear holo top coat. Shown is 2 coats over 2 coats of Teal Another Tail. Purchase KBShimmer products through KBShimmer.com and internationally from Harlow & Co. They offer a variety of products including nail polish, soaps, lotions, and lip balms. Be sure to follow KBShimmer on Facebook, Twitter,Instagram and Pinterest.